German Shepherd Life Span & How To Extend It! If you own a German Shepherd, then you probably can’t imagine living without your best friend. Read on to see some tips on extending your German Shepherd life span. We all want to keep our dogs with us as long as possible, which is why we need to give them a certain level of care. Most German Shepherds can live 9 to 13 years if they are in good shape mentally and physically. Here are some things that you can do to extend — and improve the quality of — your German Shepherd life span. Tooth decay is a very common, yet dangerous health problem for German Shepherds (and dogs in general). This is because tooth decay not only creates dental problems, but it can cause infections throughout the body, especially in the heart and kidneys. Most German Shepherds are not going to have picture perfect teeth or fresh breath like a person, but their teeth and gums should be reasonably clean. You can buy a special kit to brush a German Shepherd’s teeth which includes a small brush and toothpaste. The best brush to use is double-headed with the brushes at a 45 degree angle to clean below the gumline, like those offered by Petosan. Brush their teeth at least a couple of times every week to keep them clean, but never use human toothpaste, because it can be harmful to German Shepherds. If your German Shepherd has a significant buildup of plaque, then you should visit a veterinarian to have it removed. Unfortunately, the obesity crisis has affected dogs as well as people. German Shepherds can become overweight if they eat a lot of fatty human foods, or even if they eat too much dog food and don’t get enough exercise. One way to extend your German Shepherd life span is to make an effort to keep them at a healthy weight at all times. Keep track of how much you feed your German Shepherd on a daily basis and keep them on a consistent schedule. Some fresh vegetables are okay for your German Shepherd to eat occasionally, or you can purchase organic pet food. German Shepherds need exercise in the same way that people do. Ideally, your German Shepherd should get at least an hour of exercise every day to improve their health and regulate their weight. The exercise does not need to be organized into a routine, but they should go outside and run or explore for a while (just as people), in addition to the several regular walks you take them on every day, of course. 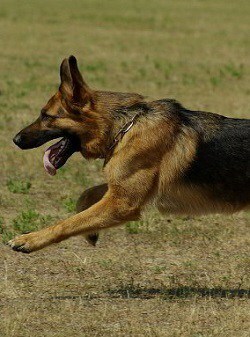 You can also have your German Shepherds play with other dogs during exercise time. Dogs tend to enjoy this, it helps them maintain a healthy weight. It can also keep them emotionally healthy. As the saying goes, an ounce of prevention is worth a pound of cure. Regular checkups with your veterinarian can help detect diseases and health problems early on, while they can still be treated. The same goes for vaccinations, which can save lives. Experts recommend that German Shepherds should visit the veterinarian at least once a yearwhen they are fully grown and two to four times per year while they are puppies. Everyone needs time to relax, including your German Shepherd. Stress can have a negative effect on dogs if they are in a state of constant anxiety. There should be some type of balance where your German Shepherd can get some exercise, but also have time to be independent from the family and get some rest. It takes a lot of energy to run around with the family and keep up with the excitement, so they need some time to sleep on their own. Allow your German Shepherd to rest for at least an hour every day and do not force them to do activities if they are not interested. The key to long life in German Shepherds is to provide them with a healthy lifestyle, which includes maintaining a healthy weight, daily exercise, relaxation, and regular checkups. Think of your pet’s well being in the same way that you would think of a family member’s. German Shepherds can tell the difference in the things that you do for them and they truly appreciate all of your care and support.